Google has launched a new social networking site, Google+, for field trials. The site is designed to rival Facebook, which has now gathered over 500m users. "We'd like to bring the nuance and richness of real-life sharing to software. We want to make Google better by including you, your relationships, and your interests. And so begins the Google+ project," said Vic Gundotra, Senior Vice President, Engineering in a post on the official Google Blog. The new social networking site features +Circles, designed to allow users to share what they want with specific groups of people or social circles, instead of sharing with all friends. "From close family to foodies, we found that people already use real-life circles to express themselves, and to share with precisely the right folks. So we did the only thing that made sense: we brought Circles to software. Just make a circle, add your people, and share what's new - just like any other day," said Gundotra. The site also features +Sparks, an online sharing engine which is designed to deliver content from across the internet to users in 40 different languages, based on a user's interests. +Mobile : These days a phone is the perfect sharing accessory: it's always with you, it's always online, and it's how we stay close with our closest friends. We didn't want "just" a mobile experience, however, so with Google+ we focused on things (like GPS, cameras, and messaging) to make your pocket computer even more personal. Getting photos off your phone is a huge pain, so most of us don't even bother. Of course pictures are meant to be shared, not stranded, so we created Instant Upload to help you never leave a photo behind. While you're snapping pictures, and with your permission, Google+ adds your photos to a private album in the cloud. +Huddle :Coordinating with friends and family in real-time is really hard in real life. After all, everyone's on different schedules, in different places, and plans can change at any moment. Phone calls and text messages can work in a pinch, but they're not quite right for getting the gang together. So Google+ includes Huddle, a group messaging experience that lets everyone inside the circle know what's going on, right this second. +You :That's the Google+ project so far: Circles, Sparks, Hangouts and mobile. +Hangouts is an onscreen social gathering tool, designed to combine an online meet-up with live multi-person video. The +Mobile application in Google+ lets users share directly from their phones and includes support for features like GPS, cameras, and messaging capabilities. Google+'s +Location feature is designed to allow users to share where they are on every post they send out if they choose. he +Instant Upload feature uploads photos directly from your phone as you are shooting to a private album in the cloud, with a user's permission, ready to share when the user wants to. According to Google, +Huddle allows users to coordinate with friends and family via group messaging, which lets everyone inside the specific Circle know what's going on. Google+ is currently available on the Android Market and mobile web. If you can say it, you can search for it. You can use Voice Search on the English version of Google.com if you're using the latest version of Chrome. If you already have Chrome installed, click the wrench icon and select About Google Chrome to check for a new version. If you don’t have Chrome, you can download Google Chrome . Make sure your computer has a working microphone. While some laptops and desktops have built-in microphones, others require external ones. You should be able to test the microphone in your computer’s audio settings in system preferences or control panel. The Internet's global coordinator approved the creation of website addresses ending in corporate names, triggering one of the biggest ever shakeups in how the web operates. The Internet Corporation for Assigned Names and Numbers (ICANN) voted overwhelmingly in favour of the proposal at a meeting in Singapore despite fears the shift would cause some confusion and favour large companies. Websites will soon be able to end with anything from ".shop" to ".canon" after the group that manages Internet addresses approved what it called a historic change in a statement on its website Monday. The Internet Corporation for Assigned Names and Numbers, which until now allowed 22 suffixes including ".com" and ".org," will accept requests for almost any word in any language from Jan. 12 to April 12. Under the changes, businesses will no longer be restricted to the list of generic top level domains (gthat include .com, .net and .org when they apply to register a website address. Industry observers say global giants such as Apple, Toyota and BMW could be in the vanguard of launching websites with their own domain names, ending in ".apple", ".toyota" and ".bmw", as could a city or a trademark. ICANN chairman Peter Thrush said at a news conference the new naming system will be a "tremendous opportunity for people to take control of this aspect of their branding and develop it in their own way." ICANN chief executive Rod Beckstrom said applications for the new web suffixes will open on January 12 next year and close 90 days later. The corporate domain names won't come cheap.It will cost a company $185,000 just to apply and there are a number of criteria that must be met before ICANN will give the nod for a firm to own the domain name of its choice.The fee is needed to recoup the costs associated with the new gTLD programme and to ensure that it is fully funded, ICANN said. It would also weed out opportunistic applicants seeking to resell domain names for a profit after buying them cheaply, a problem in the earlier days of the Internet. Rail ticket booking counter to take hours to stand in line will soon be a thing of the past era. E - After railway ticket booking tickets from the mobile facility is going to start. The service is expected to start from July2011. Rail Yatri sitting at home will be able to book train tickets from your Smart mobile. Is certain that the railway passenger via MMS from mobile to send images of train tickets. Image on the screen of mobile tickets will be valid only for travel, tickets will not need to take print. But during the journey will take passengers along with ID proof. Rail Ministry officials to mobile ticket booking IRCTC (Indian Railway Catering and Tourism) will have to register on the website. Department from an ID and password will be issued. Thereafter Yatri IRCTC's website on your mobile will be able to book advance tickets. Ticket booking on mobile screen - icon A form going to be filled online. The name, address, train number, class reservations, tour dates, etc. The required information will have mobile number. This feature has to be smart mobile which is the Internet. Smart mobile holder will be able to book tickets for their relatives. Passenger debit, credit or cash card will pay the ticket. Mobile ticketing on trains in addition to the root of the mobile screen, hire, berth availability etc. The information will also be available. Mobile Ticketing to the leading nationalized banks of the railway has been compromised. Officials of the payment process technology is being plugged. Normally Thunderbird support import of Email from OUTLOOK but it don't have option for Exporting as of now. There is no direct option to export to MS OUTLOOK formatThis process is a bit more complex . Outlook doesn’t directly import Thunderbirds email, however with the right tools, and some time, it can be done.The first thing you’ll need is a program called IMAPSize. It’s a free Windows application that has a built in tool called mbox2eml. This handy program is used to convert Thunderbird’s mbox email files into eml files. The mbox files are found in your Thunderbirds profile folder (usually in the mail -> local folders). If you don’t see any files with the extension mbox, then it’s the ones without an extension. The downside here is that each folder you have in Thunderbird is a seperate mbox file. You have to convert each one. Anything in a sub folder will have to be converted too and you may start to loose your folder structure. Oh well, you can always put it back together later. Once everything is in eml format, you must now startup Outlook Express! That’s right, Express. No need to setup an email account in there, but you should setup all your folders to mirror what you had in Thunderbird. Then, open the folders on your computer that were created from the mbox2email tool and drag the individual eml files into the corresponding Outlook Express folders. You can drag and drop as many eml files as you want, but you can’t drag in a folder. Once you’ve copied all your emails into Outlook Express, you can now import them into Outlook.Startup Outlook, create your profile and once that’s all setup, go to Import/Export, import from another application and choose Outlook Express. Street View in Google Maps lets you explore places through 360-degree street-level imagery, whether you're looking at locations in your town or across the globe. With Street View, you can check out a restaurant before going there, find beautiful places around the world to visit on your next vacation, or check out neighborhoods when you're looking to move. On 26 MAY 2011Google announced that it will begin imagery collection in Bangalore Nrityagram Dance Village in , and will continue capturing various parts of Bengaluru over the next few weeks for the Street View feature in Google Maps. The images will be made available at a later date in Street View on Google Maps. 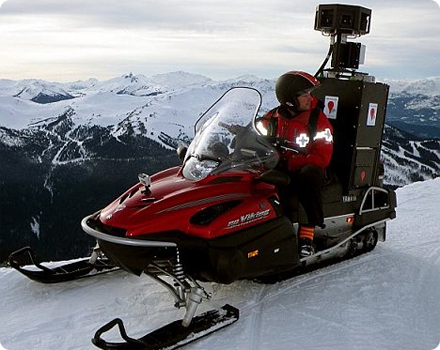 Street View is a popular feature of Google Maps, already available in more than 27 countries. 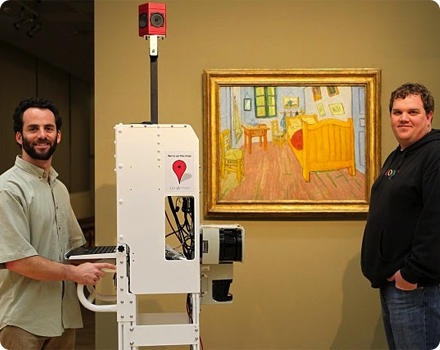 It allows users to virtually explore and navigate a neighborhood through panoramic street-level images. It is also available on Google Maps for mobile. 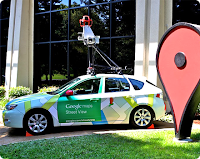 India is the 28th country to have street view, the first being the US which had street view way back in 2007. Just yesterday Google had announced listing of public transport buses in Ahmedabad and Delhi in Google maps. In countries where Street View is available, the user can access street-level imagery by zooming into the lowest level on Google Maps, or by dragging the orange "Pegman" icon on the left-hand side of the map onto a blue highlighted street. 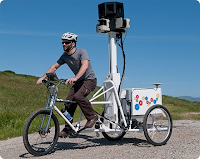 In addition to the cars, the Google Trike - a specially designed three-wheel pedi-cab with a camera system mounted on top - will start gathering images from select locations in the area such as the Nrityagram Dance Village over the next few weeks. 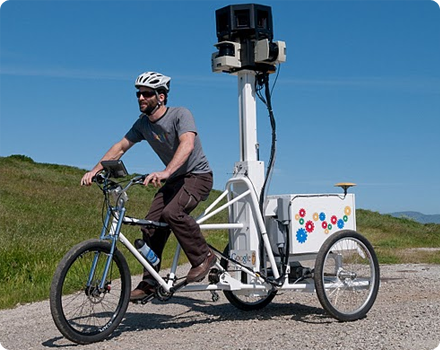 The Trike has already collected imagery from dozens of famed places around the world, including Stonehenge in the United Kingdom, Pompei in Italy, Legoland in California, and Versailles in France. Lynne Fernandez, Managing Trustee, Nrityagram Dance Village said, "We are very excited to be on Street View. I understand that the Trike can go off the beaten path to photograph some of the most remote and beautiful places on earth, so anyone can explore them from anywhere. It will provide a scenic virtual view of Nrityagram and that's the closest to actually being here!" Vinay Goel, Product Head, Google India said, "We decided to start driving in Bangalore because it is the IT capital of India and feel that the IT savvy users will be able to leverage the benefits of the product to the fullest. Street View is useful for urban development planners, law enforcement agencies, househunters, and travelers. It lets users check out restaurants before arriving, make travel plans and arrange meeting points. 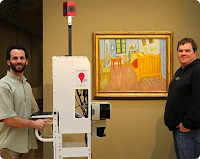 Businesses can also benefit from the Street View technology by embedding Google Maps directly into their site for free. Hotels can use it to show off the convenience of their location, and restaurants can use it to raise awareness." Google has developed technology that effectively blurs human faces and number plates of vehicles to render them unidentifiable. 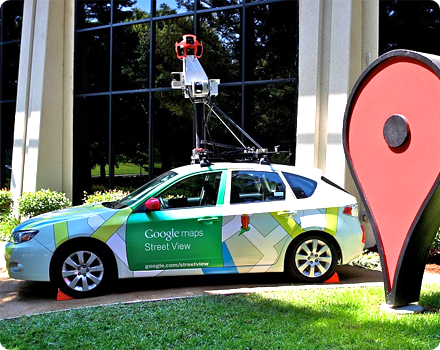 Street View is designed to comply with all local laws including those related to security and privacy in India. Vinay Goel added, "We are committed to balancing the needs of our users with concerns about security. At Google, we recognize the sensitivity associated with certain locations and are committed to working with relevant stakeholders to ensure that their concerns are addressed." Apple new Operating System: Introducing OS X Lion. OS X Lion. The world's most advanced desktop operating system advances even further. The Mac App Store is available only to persons age 13 or older in the U.S. and many other countries; see www.apple.com/support/mac/app-store/ww/ for a list of countries. Requires compatible hardware and software, and Internet access; broadband recommended (fees may apply). Terms apply. Apps are available on the Mac App Store. Some applications are not available in all areas. Application availability and pricing are subject to change. Microsoft recently previewed Windows 8 to customers, partners and media at the Computex show in Taipei. Vice President Mike Angiulo ran the system on tablets, notebooks and desktop systems made by Dell Inc, Asustek Computer Inc, and Quanta Computer Inc using chips and technology from ARM Holdings Plc, Qualcomm Inc, Texas Instruments Inc and Nvidia Corp. Here are --- things you need to know about Windows 8 which Microsoft claims 8 is a reimagining of Windows, from the chip to the interface. The tile-based Start screen replaces the Windows Start menu with a customizable, scalable full-screen view of apps. The design of the software is similar to the tile interface on Microsoft’s Windows Phone 7 mobile handset software. Similar to it, tiles in Windows 8 can be automatically updated to display information from apps on the computer’s start screen, so a weather app can tell the user that it’s forecast to be sunny without requiring them to open the application. The Windows 8 demo showed that the new OS will run on a range of hardware devices from traditional PCs to laptops and tablets, using both touchscreen and mouse and keyboard commands. The company said that while the new user interface is designed and optimized for touch, it works equally well with a mouse and keyboard. Underneath the new OS is the old Windows that most users are accustomed to. It will run old Windows apps. If the apps are not optimized for touch, it is just fine as it would run them in the old interface with a keyboard and mouse. Windows 8 also offers users the ability to snap and resize an app to the side of the screen, so that they can multitask using the capabilities of Windows.